Welcome to the fifth episode of Kidmin Talk, the webcast show hosted by Karl Bastian, the Kidologist. Listen here on Kidology or subscribe via iTunes to listen on-the-go with your iPhone, iPod, iPad, or other mobile device. One of the most creative children's church curriculum vendors on Kidology.org is River's Edge. Currently they are featuring the Heaven's Kitchen series. Enter TALK1018 and get 20% OFF through 11/30/2011! PLUS: Download the complete family supplement, Heaven's Kitchen Family Concoctions (PDF, 4MB, LIMITED TIME ONLY), as a sample of the quality you will find in River's Edge resources! 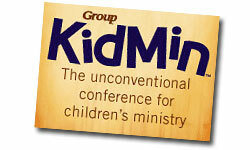 Kidmin Conference in Chicago, did you go? KidBuilders Conference Audio Downloads - Limited Time! God called us to "Go And Make Disciples"
That is our HIGHEST calling! Can you point out YOUR disciples? KIDMIN WINNER! Our winner this week is Brenda Zizolfo! She wins a Righteous Pop Music CD! It was her first post on Kidology.org too, congrats! Todd McKeever guessed it as well, but he included a string of entries including Dunkin Donuts. Come on! LOL! But I'm still going to send him an autographed Almighty Bible Acts Book, since he listed "Discipleship" FIRST. What Kidmin Talk Key Word do YOU think I'll use (or do YOU SUGGEST!?) for the letter "E"? WANT TO BE A WINNER? Submit your guess or suggestion for next week's Kidmin Talk Key Word for the letter "E" - by E-mail or Twitter. Earn extra chances to win by promoting @KidminTalk via Twitter! Marty McCutcheon "Sent from his iPad" a question regarding what makes a great volunteer. "How can volunteers help support their leaders and keep encouraged and growing?" Marty has been a volunteer for 20 years and still has his classic Kidology Handbook from a Kid U conference years ago! First of all, Marty, please know that the VAST majority of the traffic on Kidology.org includes volunteers, not professional children's pastors. When I write and talk, YOU are who I have in mind most of the time. Many CP's are too busy to be surfing the 'net; they have a ministry to run, so volunteers like you are a true blessing! How can Volunteers H.E.L.P. their leader? Look for things that your leader is doing that you can do, and say, "Let me do that for you." Actively take things away from you leader that you can do. Don't worry if they can do it better than you. That doesn't matter. (And that is an assumption that often isn't true anyway.) Your leader needs volunteers who will take the initiative to do things because believe it or not, they hate asking people, because they feel like they are always asking and they secretly believe everyone is dreading being asked. So just help without being asked, and you will bless their socks right off! Almost every encouraging note I get starts with, "I know you must get lots of these notes, but..." and I always laugh, because I hardly get any! People assume that their leaders have encouragement pouring in from all directions, and the reality is they don't. On any given day they may just feel like throwing in the towel. They probably won't, but they are human too and often could really use a word of praise or encouragement. When was the last time you simply gave them a compliment, attaboy/girl, or took the time to really express what it is they do that is a blessing to you or the children? They need it year around. "Pastor Appreciation Month" can be the worst when they get not one note or card. Psst, that's this month! Your leader can't lead everything! Volunteers who step up and lead areas of ministry are superstars to the pastoral staff! They are the backbone of the church and their reward will be great since they are serving for eternal reward, not a paycheck! Is there an area of ministry that you have a passion for? Instead of helping out, maybe it is time to step up and say, "I'll lead that pastor, you just tell me which way to go, and I'll take it from here." You'll get the help and support you need, but the ministry will be better off as a whole for shared leadership! Only mentioned last because it is the fourth letter of the word "HELP." But DO pray for your leaders! Ask them for prayer requests and follow up on those prayer requests by asking for updates - that shows you are truly praying! They are under constant spiritual warefare because they are on the front lines reaching kids! Have their backs and hold them up! They will appreciate it so much and it will make a real difference in their life and in the ministry too! If I drop your name on the show and you post to the comments below before the next show, you will win a super duper random Kidology prize! Want to increase the chances of Karl "dropping your name?" Interact with the show by E-mail, Twitter or the comments below! Let Karl know you are listening!